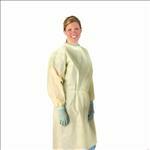 AAMI Level 2 Isolation Gowns; MUST CALL TO ORDER . � Made from a medium weight, yellow, multi-ply material and provides 360 degree protection. � Available with elastic or thumb loop wrists. � Protects against fluids under light to moderate pressure conditions. � Green coded neck binding.